The small community of Rock Creek & the bridge over its namesake creek in the middle of the image. 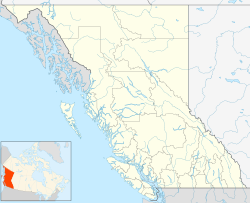 Rock Creek is an unincorporated settlement in the Boundary Country of the Southern Interior of British Columbia, Canada. 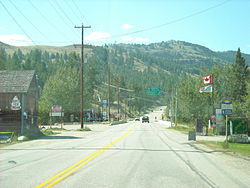 Located at the confluence of the Kettle River with the eponymous Rock Creek, site of the Rock Creek Gold Rush of 1860, the community also lies at the junction of British Columbia Highway 33 (from Kelowna via Big White) and British Columbia Highway 3, otherwise known as the Crowsnest Highway, which runs across the south of the province. Rock Creek was one of the settlements along the Dewdney Trail in gold rush times and, though very small today, remains important as a regional service centre for the farming and mining communities of the Boundary Country and the Monashee Country, which lies northwards. It is the effective basetown for Mount Baldy Ski Area, which lies to its northwest and overlooks the Okanagan Valley town of Oliver. Rock Creek was featured on the historical television documentary series Gold Trails and Ghost Towns, Season 3, Episode 8. ^ "Rock Creek (community)". BC Geographical Names. ^ "Rock Creek (creek)". BC Geographical Names.